Life in Mumbai is hectic, exciting, and constantly buzzing. However, there are times when one needs to get away from the overwhelming pace of Mumbai. And the best way to escape from the frenzied and mundane life of the metro is to set for a quick getaway. Flummoxed by the countless options? Fret not. We bring you, the top pool villas just a couple of hours away from Mumbai, where you can drown all your worries and frustrations. Just 2 hours away from Mumbai, enter the world where artistic murals and frescos adorn the whitewashed walls. SaffronStays Casa Blanca, a spacious home, boasts of 4 bedrooms, a dance floor accompanied by a DJ console and speakers, a poker table, Wi-Fi and a mini library with board games. And not to forget, the POOL, which makes it the perfect getaway for large groups of friends and families. 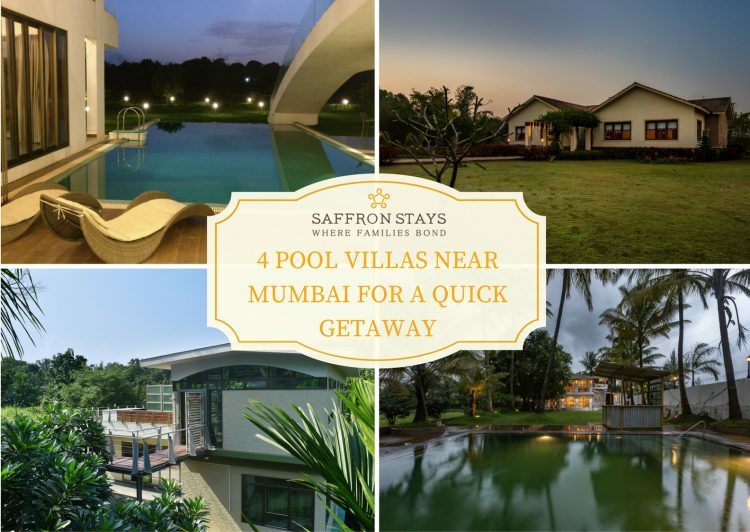 A 5-bedroom home with a private pool and landscaped gardens, set on a sprawling 6 acre estate, SaffronStays 9 Palms can host up to 25 guests. With colourful interiors and eclectic decor, this expansive home is ideal for corporate off-sites, family get together or a quick getaway with group of friends. A mere 3 hour drive from Mumbai, it is an idyllic getaway for a large group. Stocked with games such as air-hockey, pool table, table tennis, basketball and various board games, SaffronStays Bellini, is the ideal place to relive the good old memories. This 3 bedroom property can accommodate up to 15 guests. Take a dip in the terrace pool or just laze on the spacious deck or find a private corner to read a book! Just 10 minutes from the Kihim beach, this sleek looking duplex oozes luxury from its bedrooms to game rooms to bathrooms. Roll down the green grass slope or challenge your friends to a game of table tennis or snooker or glide in the pool! With style and sophistication exuding from every inch of this 4 bedroom home, SaffronStays Gardenia can host up to 16 guests at a time. Take the Matheran Toy Train to a 130-Year-Old Parsi Wonderland!